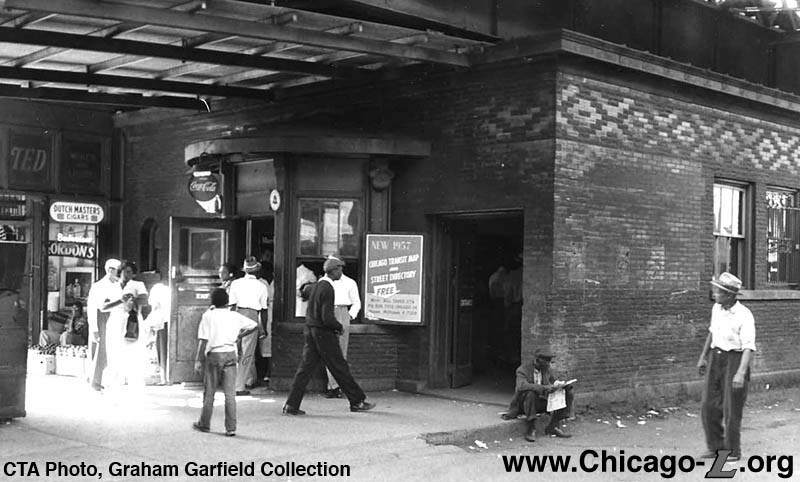 This page consists of a brief history of the Chicago “EL” History, with a focus on the 43rd Street Green Line Station that is located on The Forum’s block. This history is important to understanding how people traveled to the events at The Forum. Note: The information below should not be taken as a complete account of the transit’s history, for more information please use the sources listed below. “43rd (4300S/300E)” Chicago “L”. org. Banich, Terence. “Remnants of the “L.” Forgotten Chicago. “Chicago Rapid Transit Co.”Encyclopedia of Chicago. Corcoran Michael and Arnie Bernstein. Hollywood on Lake Michigan: 100+ Years of Chicago and the Movies. Chicago: Illinois, Chicago Review Press, 2013. Hoyt, Homer. One Hundred Years of Land Values in Chicago: The Relationship of the Growth of Chicago to the Rise of Its Land Values, 1830-1933. Washington, DC: Beard Books, 2000. Mass transit started in Chicago, when the contractors drove the first spike for Chicago’s first streetcar line at State and Randolph Streets. Privately owned Chicago and South Side Rapid Transit Railroad Company is incorporated and owns the first actual rail line. Due to the superiority of transportation on the South Side the land values of the area had uninterrupted rise, due to both the cable and horse car lines. Cable line was completed on Cottage Grove to Sixty-third street and a horse-car line was constructed east on Sixty-third street. The rail line then extended east to Jackson Park, the development of the line led the area to grow from “prairie” land to homes, apartments, and commercial properties. Chicago was selected as host the World’s Colombian Exposition by the U.S. Congress and Jackson Park was selected as the fair’s site, the Alley “L” began making plans to extend its line directly into the fairgrounds. First “L” train trip consisted of six wooden olive green and yellow coaches operated by steam locomotion taking its inaugural trip down the elevated “Alley L” from Congress Street to 39th Street. The trip took 9.5 minutes to complete. Era of Privately owned railroad companies began creating rail lines (Lake Street Elevated Railroad Company, the Metropolitan West Side Elevated Railroad Company; the Union Elevated Railroad Company; and the Northwestern Elevated Railroad Company), these private concerns built much of the infrastructure for the CTA rail lines we now know as the Red, Blue, Green, Brown and Pink Lines. Completion of South Side Elevated line to Sixty-third street. On May 12, 1893, the South Side “L” reached the fair eleven days after it opened. It carried more than 12 million individuals to the fair although there were other options for people including cable cars, shore boats, and electric trolleys. However, when the fair ended, ridership decreased on the “L” due to lack of development along the line. The Lake Street Elevated railroad was electrified in 1896, and the South Side Elevated railroad in 1898 (previously they used tiny ”steam dummy” engines, which burned hard coal). The African American population expanded to encompass a solid block from Wabash Ave from 26th to 39th street. The private rapid transit companies merged in to the Chicago Rapid Transit Company (CRT) in an attempt to create a common entity because the companies were facing financial difficulties, ironically more track was installed at this time to encompass 227.49 miles. CRT was led by Chicago utilities titan Samuel Insull and was a privately owned company, but was subjugated to government regulation. The five (the Chicago Railways Company, the Chicago City Railway Company, the Calumet and South Chicago Railway Company, the Chicago and Western Railway Company, and the Southern Street Railway Company) street railways was comprised under the name of Chicago Surface Lines. The CRT and the CSL was in bankruptcy or receivership, the CSL’s contract ended in 1938 and the CRT’s 1945. Both companies were operating cars in decay and/or worn with age; did not deal with inflation; and were inflexible with routing and schedules. [Insert link to Map of Chicago Rapid Transit Lines]. Illinois General Assembly created the Chicago Transit Authority (CTA), which allowed it to acquire, own, and operate the transportation system in the Chicago metropolitan area of Cook County, but it also required that at least 50% of its operating budget be made from the fares. This was in order to meet costs of operation, plant renewal, modernization and expansion needed to match the public service demands caused by the growth of the city and its suburbs. In order to purchase the CRT and the CSL, the CTA was authorized to issue revenue bonds secured by their own earnings, $105 million worth of bonds were issued in the initial offering. The “L” was fully operated by the CTA. During this time the CTA made changes by closing stations and branches in order to combat the rise of cars and the highways. However, the 43rd street stop was not on the chopping block. The movie The Sting used the old station at 43rd and Calumet as set for a scene featuring Robert Redford. The 43rd station house was destroyed by fire. Video of Green Line South to North by John Schmidt, see The Forum Hall at 43rd Street Station. CTA closed the entire Green Line for a two year renovation project, at this time the station underwent remodeling on the interior. Elevators were added to the station.